Please join the Department of Computer Science in congratulating Ayush Kohli, who won the first prize in undergraduate research category in ACM student research competition in the Foundation of Software Engineering (FSE) 2017. Ayush is a member of the SoftSearch lab and works under the guidance of Dr. Amiangshu Bosu. FSE is one of the top two conferences in software engineering area and highly prestigious. This year’s FSE was held in Paderborn, Germany. The ACM Student Research Competition (SRC) is sponsored by Microsoft, offers a unique forum for undergraduate and graduate students to present their original research before a panel of judges and attendees at well-known ACM-sponsored and co-sponsored conferences. ACM SRC is the top student research competition in computer science area. 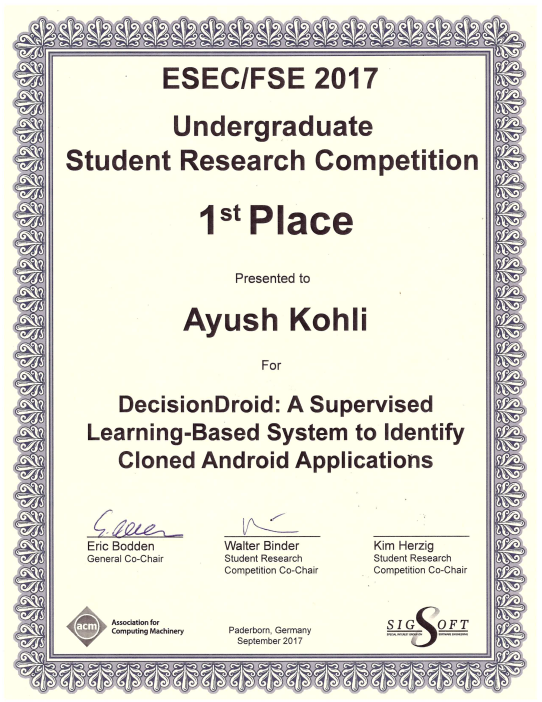 As a winner of FSE SRC, Ayush has received a certificate (attached), a medal, and $500 award from ACM. Ayush will also have the opportunity to participate in the ACM SRC Grand Finals. The top three Grand Finalist and their advisors are invited to the Annual ACM Awards Banquet where they are recognized for their accomplishments, along with prestigious ACM award winners, including the winner of the Turing Award (also known as the “Nobel Prize of Computing”).